Oysters are grown in some kind of suspension or off-bottom culture and regularly removed, tumbled in a mechanical tumbler, and returned. Or they may be grown in bags attached to longlines and floats, so the bags invert with the rising and falling tides. 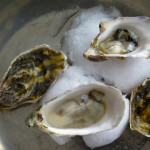 This constant jostling chips off the growing edge of the oyster and results in a stronger shell, a short and deep cup, and a full meat with little room for liquor. Because it slows down growth rates and is labor- and equipment-intensive, tumbled oysters tend to be more expensive.